Prime Minister Narendra Modi addressing a rally in Jamui on Tuesday. "Recall how the Congress treated architect of our Constitution, Dr Babasaheb Ambedkar. How he got neglected? Congress plotted many conspiracies to defeat him. Congress did everything possible to have Babasaheb defeated. It conspired to have his memory erased from the public mind. It is important that youth of today knows about these facts," he said at a public rally here where Lok Janshakti Party (LJP) leader Chirag Paswan, son of party president Ram Vilas Paswan, is in the fray. The Prime Minister claimed that the Congress remembered honouring its own family members, but "forgot" about Ambedkar. It was due to BJP's efforts that Ambedkar was posthumously awarded the country's highest civilian award Bharat Ratna, he said. 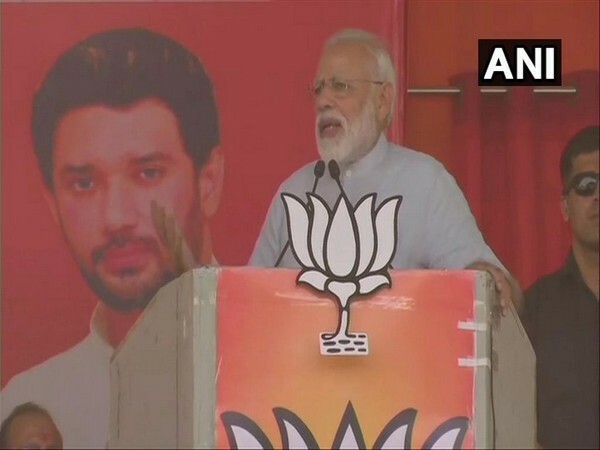 In a veiled reference to Congress party's manifesto, which promised to amend the AFSPA Act, Prime Minister Modi said, "I want to request the people to listen and keep in mind different types of promises and statements which are being made in regard to national security, Kashmir and our armed forces. The people should give a befitting reply in this election." Trashing the claims of the Opposition that BJP was doing away with reserved category quota, Modi remarked that "no one can remove reservations". "When Morarji Desai and Atal Bihari Vajpayee's governments were in power, they were making such statements. Even in Modi government, they are saying the same thing. I want people of Bihar to give a befitting reply to those who are spreading rumours about reservations. Be it Modi or anyone else, no one can remove reservations," he emphasised. Continuing his tirade against the Congress, the Prime Minister claimed that the Congress did not do 'vikas' (development) for the Dalits and Other Backward Classes, but only cared about their 'vikas'. Asserting that good governance goes into "reverse gear" when Congress and its allies are in power, Prime Minister Modi said, "When they are in power, terrorism, violence, corruption, prices and black money rises. When Congress is in power, the nation's prosperity, credibility and morale of our armed forces go down." Questioning the Opposition's demands for proof over the air strike, the Prime Minister said, "After Pulwama attack, our valiant and brave armed forces killed terrorists (deep inside Pakistan). When the entire world is talking about us, the 'mahamilawati' is asking for proof. They are finding ways to demean our armed forces. They are speaking in the language of Pakistan. They are making statements on behalf of Pakistan". Modi said that electorates should give befitting reply to those questioning the valour of the armed forces.